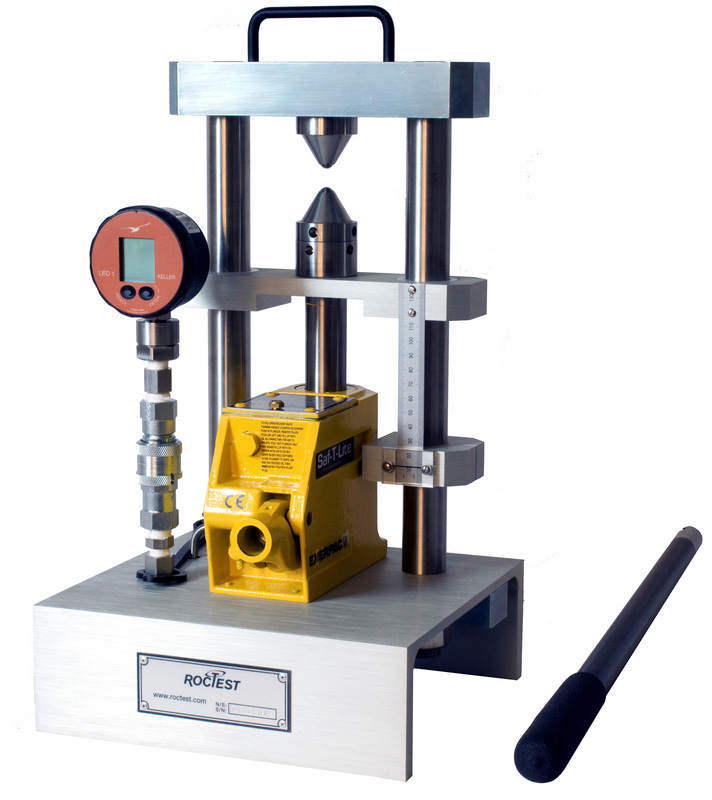 The PIL-7 point load tester consists of a loading frame, a mounted hydraulic ram and a pressure gauge for maximum load indication. An upper conical platen is fixed on the frame and a lower one on the jack piston. A graduated scale is fixed on the frame and indicates the specimen diameter. The specimen is positioned between the conical platens. The platens are then closed to make contact. The distance “De” between the points of contact is read on the scale. The load is increased such that failure occurs within 10 to 60 sec. and the failure load “P” is read and recorded. The Point Load Tester allows the user to determine an “Uncorrected Point Load Strength Index” (Is). This index must be corrected to a standard equivalent diameter (De) of 50 mm. It then becomes a unique property of the rock tested (Is(50)) which is most useful in rock strength classification.Rock anisotropy is quantified by the “Strength Anisotropy Index” Ia(50). This index is the ratio of the greatest to least Is(50) index measured respectively perpendicular and parallel to the existing planes of weakness.The uniaxial tensile (UTS) and compressive (UCS) strengths can be approximated from the Is(50) index. The UTS is about 1.25 times Is(50) and the UCS is normally between 20 and 25 times the Is(50) index. The ISRM* “Suggested Method for Determining Point Load Strength” size correction procedure is used. Is(50) is obtained either graphically, mathematically or by testing 50 mm (maximum diameter) specimens. *ISRM: International Society of Rock Mechanics. The unit includes a carrying Box.